I am sure you have seen this picture somewhere along the way in blogland. When I saw it I thought, wow that is a great chair! But wait, I am a cheapskate. So I went on the lookout at my local thrift stores..... and came up with this! isn't my cup of tea. She was $14.99 and I had a $3.00 off coupon! She went straight into my shopping cart and then sat in my basement until yesterday! and some cream velvet fabric I had laying around. I think I saved a ton! It's not perfect, but neither am I, so we will do good together. I think you done good!! real good! I LOVE it. You are so creative. Can't wait to see what you come up with next. My sister is painting a chalk board wall in her kitchen, after seeing your space on rate my space on HGTV. I just love your house. One of my favorites is the room you painted with horizontal stripes. I am going to sign up so I can rate your space this weekend. You should be soooo proud! Don't ya just love it. Now I'm on the hunt. I'm guessing that wasn't the easiest chair to reupholster with all the carving and curves around the seat. Don't you just hate removing tacks, I spent all day yesterday doing the same thing. You have done well and the chair looks great. Good on you for having a go! Turned out great! Wish I could find a good thrift store around here...I am dying for garage sale season to start back up! Wow! That's impressive! It looks beautiful! stunning! great job! beautiful and inexpensive! my kinda redo! Where on earth do you find a chair for 14.99? Great chair! 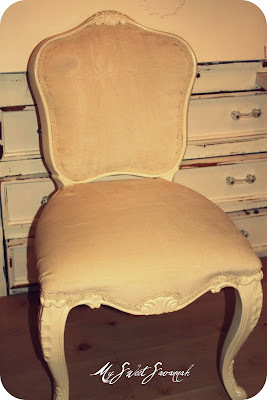 I love frenchie chairs! Right on! You did a great job. 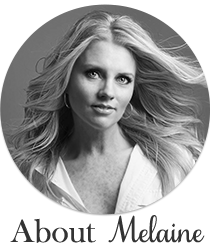 Great job, Mel! You are so talented. 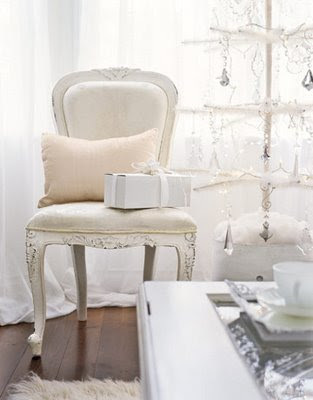 I'm inspired to get my chair makeover started now! You did a wonderful job. It looks stunning! you did a great job! Please keep me in your prayers as I head out to the Dominican/haiti sunday! Good grief! 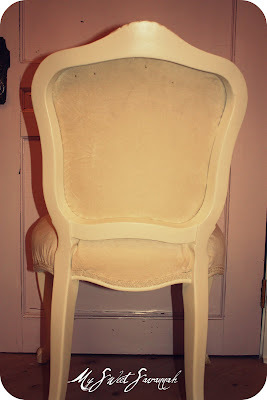 $19-- you are so thrifty- I did my own chairs too-- you can see a photo in my She Sells Seashells nursery post, but the chairs were $100 to start with, lots of elbow grease, paint and fabric-- I probably spent $200 total for 2 chairs-- still cheap, but not $19! Way to go!! Your chair looks great! I love the white on white. 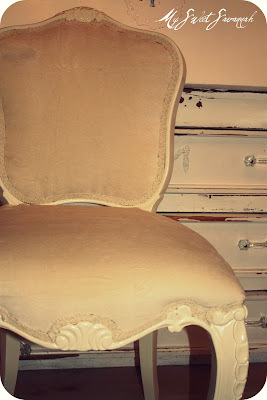 I have a new obsession with old chairs and recently bought a painted antique arm chair for my shop that looks Swedish or Italian and reupholstered it in muslin. But I may not be able to part with it! My favorite is the Louis style that you have. Very pretty! Your chair looks great! Keep up the goodwork!! I LOVE what you did here! Great blog!! It is adorable! i love finding good deals and making them into treasures! I've been looking for a chair like yours forever! I'm stalking my local Goodwill, and it's good to know that there may be one out there! Beautiful!! Great job ... imperfections are good. Very cute! and it looks so much better after you got to it! 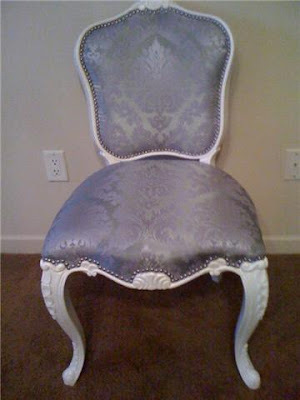 Wow, that is gorgeous, the chair alone has wonderful lines! You did a great job transforming it! Thanks for sharing. Likin it a whole bunch! Would love to find a fun chair to paint or recover for my laundry room, just for the cuteness factor! I LOVE THIS CHAIR! I have been looking for one like it for awhile. Spill the beans girl, what thrift stores are you shopping at because the ones around me never have anything that good. Your so crafty!